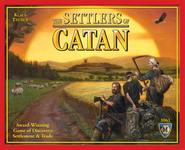 Today’s Cool Yule deal: Settlers of Catan! Settlers of Catan is one of the best board games ever printed. And from now until Christmas, if you buy Settlers of Catan and any of the expansions, you’ll save 20% AND get a free copy of Catan: Oil Springs! This entry was posted on Wednesday, December 7th, 2011 at 1:07 PM and is filed under Uncategorized. You can follow any responses to this entry through the RSS 2.0 feed. Both comments and pings are currently closed.